Big Picture Page . . . 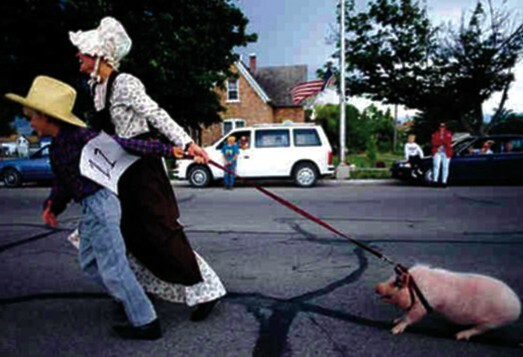 Nothing like proudly parading your prize piglet down the middle of Main Street in middle America. In some towns, this would be considered a strange sight, but others who relish the good-ole-days, dragging your pork around is commonplace for everyone except the pig, of course. This diminutive even-toed ungulate appears to be pulling back against the towing of the mother-son cutest piglet entrants at the annual Fairgrounds Foraging Friends Festival. Suzy, the piglet pictured is favored to win first prize this year, since the entrants’ neighbor’s pig grew too old and fat to enter this year’s contest and, against all the protests from PETA and the local vegan society, became more than a few tasty suppers, served with sides like baked beans, potato salad, collared greens and eggs for breakfast. Its would seem Suzy would prefer to stay home and watch the chickens roost. Onlookers on the opposite side of the street appeared more than a little dismayed to watch Suzy being dragged out in public like a child beauty pageant contestant being thrust on stage by her overly enthused, seriously confused mother. A website to save Suzy from the contest and the dinner table has been launched and received over 10,000 likes, although a large group of them were restaurateurs and delicatessen owners. Guns, Guns and More Guns?